The two former world number ones where a pale shadow of their Ryder Cup selves, erratic off the tee, wayward with their irons and utterly sterile on the greens as the Americans handed them the proverbial dog licence in recording their third successive victory together this week. The numbers said it all. The American pair were six under par to the European’s two over when the match ended on the 12th green. It was just the third time in Ryder Cup history that a pairs match had ended on the 12th green, the previous ones coming in at the Greenbrier in 1979, when Des Smyth and Ken Brown lost 7 and 6 to Hale Irwin and Tom Kite, and in 1991 at Kiawah Island when Nick Faldo and David Gilford were hammered by the same margin by Paul Azinger and Mark O’Meara. In playing his 37th match, Mickelson equalled Billy Casper for the most matches played on the American side. In winning his first three matches, Mickelson also backed up his own theory that he has been rejuvenated by Bradley. The last time the 42-year old left-hander could count his opening three game for victories was at Oak Hill in 1995 when he was 25, just a year younger than Bradley. Few pairings have made such an impact on a Ryder Cup. “Well, certainly not on the American side,” Mickelson said. “The European side has had some great teammates with Seve and Ollie and some others, but to be able to share this experience with Keegan and to partake in his great play and experience the Ryder Cup together has been really awesome. Bradley also etched his name in the record books with three successive victories equalling the best start ever by a rookie on either side, placing him in the illustrious company of Larry Nelson, Jose Maria Olazabal and Sergio Garcia. The tone was set on the first tee. As the protagonists posed for photographers, the crowd taunted the Europeans by chanting “Ma-jor winn-ers, maj-or winn-ers”, as four-time major winner Mickelson and 2011 US PGA winner Bradley stood alongside two Englishmen who have yet to crown glittering careers with a grand slam title. If Europe had hoped to get some early momentum, they were to be sorely disappointed as their own failings and some American razzle-dazzle left them behind the proverbial eight-ball. Mickelson hit a 86-yard wedge to a foot at the first but Donald, regarded as one of the best putters in the world, missed from eight feet for the half. Westwood then compounded Europe’s problems at the par-three second. With Mickelson leaving Bradley 20 feet pin high, the Worksop man dumped his tee shot in Lake Kadijah, leading to a double bogey five. There were still 16 holes to be played but the Europeans trudged to the third tee. Even when there was a glimmer of hope for Europe, the Americans found a way of snuffing it out. At the par-five fifth, with Westwood just eight feet away in three, Mickelson drilled a 15 foot birdie putt into the back of the hole to put the pressure back on the opposition. Westwood bravely holed for the half but Europe were three down minutes later when Donald lipped out for par from eight feet at the sixth after bunkering his approach from the left rough. Europe needed to make something happen but Donald missed the par-five seventh fairway, forcing Westwood to lay up on a hole where the Americans could easily reach in two and did. Mickelson, growing in confidence with every hole, hit a high draw with a hybrid to 15 feet and looked on as Donald bunkered Europe’s third. Four down after seven, Europe needed to find an oasis in the desert but turned for home five down instead when Mickelson wedged to 12 feet at the ninth and Bradley slotted the putt with a huge fist pump. “Easy, easy, easy,” chanted the crowd as Bradley and Mickelson touched knuckles with a raucous gallery walking through a tunnel of noise to the par-five 10th which the Americans won easily with a a two-putt birdie after Donald, sorely out of form in his home town, had hit a lay up into sand. Mercifully from a European standpoint, the humiliation ended on the 12th green. 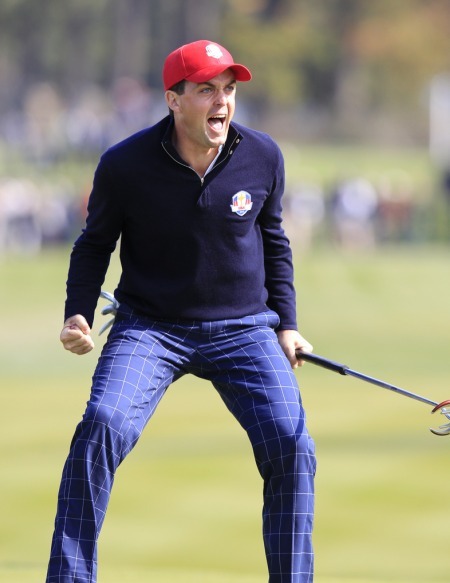 The Americans had butchered the hole but Mickelson recovered by conjuring a magical wedge that caught a slope 20 feet from the pin and trickled down to a foot for a conceded par. Westwood left his 30-foot birdie putt five feet short. Facing a tester to extend the match, Donald pushed it wide, summing up a forgettable morning. Snedeker: "I'm going to try to beat their brains in"
Brandt Snedeker is making life fun for Tiger Woods and Phil Mickelson at the Ryder Cup. Photo Eoin Clarke/www.golffile.ieOne would think that six defeats in eight Ryder Cup matches would leave a man battle-weary and fearful of another European mauling. Keegan Bradley holes another putt. Picture: Fran Caffrey/www.Golffile.ie.On paper it was a match that the United States should never have won yet Phil Mickelson and Keegan Bradley defied the record books and ripped the heart out of Jose Maria Olazabal’s side by consigning Luke Donald and Sergio Garcia to their first defeat in a combined 15 foursomes matches with a thrilling 4 and 3 victory.